Here in the Oasis you can be whoever you want. Come in cosplay and get pictures with your favorite avatars Parzival and Art3mis. Props and background options available for your photo. Instant hi-res digital photos for only $5 (cards accepted). No more than 4 people per photo. See you there fellow gunters! First to the key! 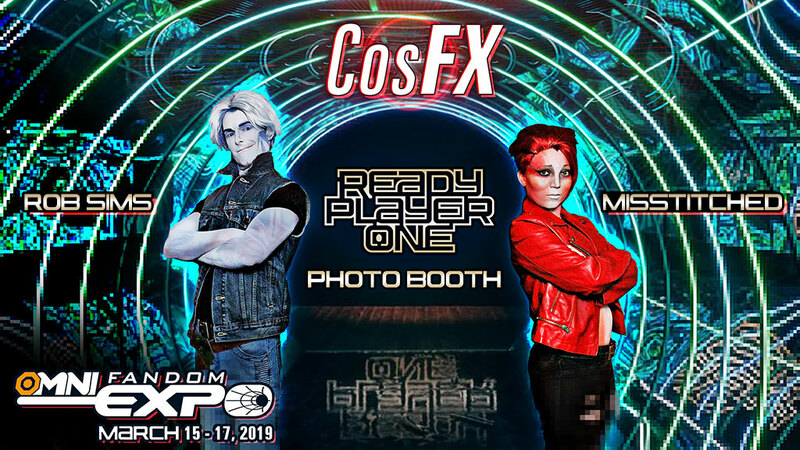 CosFx Team - Rob Sims and MisStitched are professional cosplayers/designers/costume prop and set fabricators who love bringing an interactive experience to conventions like nothing fans have ever seen before. They are known for their touring Beetlejuice and Lydia Deetz Photo-Op (@bioexorcism) and are working on their newest YouTube channel CosFx. Stay tuned! Pricing: $5 each (cards accepted). No more than 4 people per photo.